(November 6, 2015) The Federal Highway Administration (FHWA) approved North Carolina's State Transportation Improvement Program (STIP) in October. The STIP is a list of transportation projects expected to be constructed over the next 10 years. The North Carolina Department of Transportation (NCDOT) had previously approved the STIP in early June, and the Charlotte Regional Planning Organization (CRTPO) had approved the Charlotte area portion of the STIP in August. Funding for projects scheduled to begin within the first five years of the STIP are considered committed, and two Highway 160 projects are among the committed projects. A third Highway 160 project will be evaluated for prioritization along with other transportation projects for possible funding after 2020. 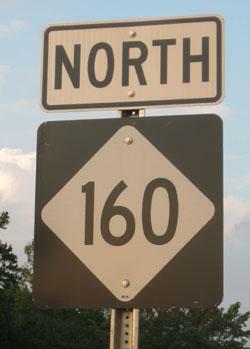 The two Highway 160 projects included in the STIP are listed on Page 19 of the NCDOT Division 10 STIP. Some turn lanes were added at this intersection last year by a developer, and Lennar Homes will be required to make additional improvements to accommodate additional traffic expected to be generated by its new residential development planned near the intersection of Hamilton Road and Smith Road. This 4.2 mile widening project extends along Steele Creek Rd from Shopton Rd West to South Tryon St (NC Highway 49) in Charlotte. Improvements include widening the existing roadway from two (2) lanes to four (4) lanes and installing bike lanes and sidewalks. This 2.2 mile widening project extends along Steele Creek Rd from South Tryon Street (NC Highway 49) to the South Carolina state line. Improvements include widening the existing roadway from two (2) lanes to four (4) lanes and installing bike lanes and sidewalks. 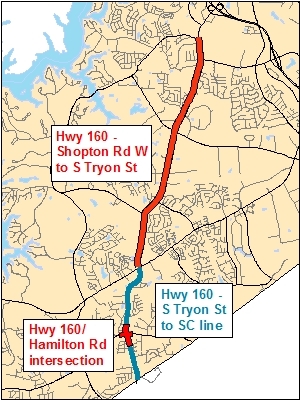 This project did not score well enough to be included in the latest STIP, but NCDOT staff separately evaluated the Hamilton Road intersection, which was included in the STIP. This widening project will be evaluated for possible inclusion in the next update of the STIP in 2017. See Prioritization 4.0. For more details see Highway 160 Projects Move up on Funding Schedule (July 1, 2015).